Toddlers who watch three hours of TV a day may end up educationally stunted, physically weak and prone to bullying, a study has revealed. Researchers have found that after two hours of viewing, every extra hour of TV has the potential to harm a child’s development, both physically and socially. This includes poorer vocabulary, maths skills and attention in class, victimisation by classmates and poor physical prowess at nursery. The study looked at 1,997 boys and girls aged 29 months whose parents reported their television viewing behaviour as part of the Quebec Longitudinal Study of Child Development. The researchers found that if a child watched up to two hours and 52 minutes of TV, they were unlikely to suffer any negative effects. Professor Linda Pagani, of the University of Montreal and the The Sainte-Justine University Hospital Centre, said: ‘This study only looks at the most common form of screen time, which is in the home. 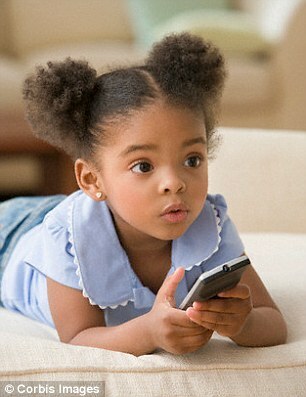 ‘However, it may be an underestimate because many child care settings use television as an activity during care giving. ‘This is the first time ever that a stringently controlled associational birth cohort study has looked at and found a relationship between too much toddler screen time and kindergarten risks for poor motor skills and psychosocial difficulties, like victimisation by classmates. ‘These findings suggest the need for better parental awareness and compliance with existing viewing recommendations put forth by the American Academy of Paediatrics. ‘The AAP discourages watching television during infancy and recommends not more than two hours per day beyond age two. The study was published in the journal Paediatric Research. Professor Pagani said that she decided to look into aspects of school readiness such as motor skills, which predict later physical activity and reading skills. She also looked at the likelihood of being picked on, which predicts social difficulties and skills linked to following instructions, which are in turn linked to attention systems that are regulated by the brain’s frontal lobe development. She added: ‘Because of kindergarten’s power to predict future productivity, the identification of modifiable factors that foretell not being ready for the transition to formal schooling represents an important goal for a productive society.